Where I last left you, I was on my way to Davos and the World Economic Forum. I tried twittering to keep up with what was going on, but it's really tricky spending any time writing when you are at an event like that. In the central lobby area, there are only a few seats and I would always see Justin Fox, correspondent for Time Magazine, occupying some of the few sofas along with his wife and other "Young Global Pioneers" of the World Economic Forum. I asked Justin if he had been to any of the sessions, which he said he had, but it seemed like he was always blogging. It was good that he was there though. He had a Mac and I could borrow a recharge every once in a while. 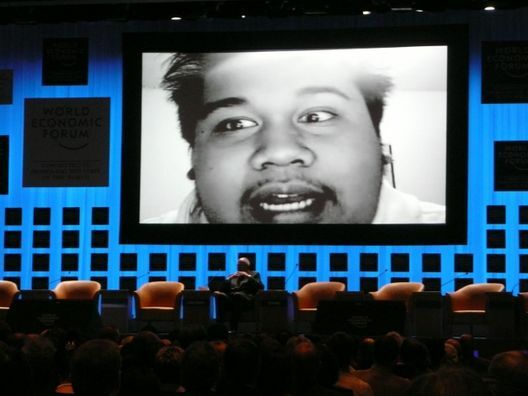 A giant YouTuber addressing 1000 people in the WEF plenary hall, while the President of Switzerland sitting alone below him is probably trying to figure out what is going on. That's the problem when there is so much stuff going on. You need to sit down and digest a huge amount of information, impressions, emotions and sheer overwhelmingness. The year before, I wrote one blog and missed so much, so I thought I should really just experience this and then write it down. Now I won't be able to get on with writing my blog properly until I do. So forgive this somewhat rambling post. 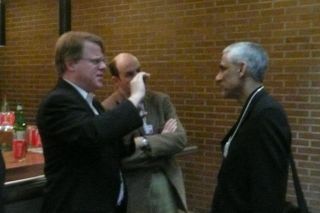 Robert Scoble interviewing Vinod Khosla. Scoble doesn't have a problem keeping up his blog. In reality, I met a lot more people. 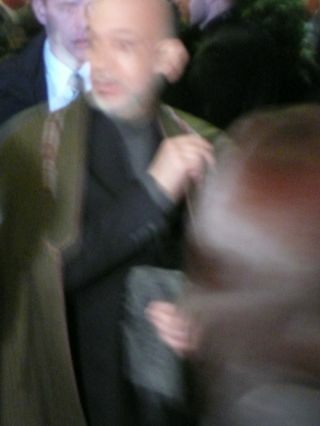 I met Tony Blair and Bono, which I thought was pretty cool. I tried to get up early(ish) and at 8am in the morning one day I just saw Blair walking down a white, glistening snow covered street with only a couple of people in tow. I just reached out as I walked in the opposite direction and said "Hello Mr. Blair." With a politician's instinct, he grinned, said hello, shook my hand and moved on. Bono came tumbling out of some party the night before along with Queen Raina of Jordan and her entourage from London, and few other celebrities. I was in an WEF IT Governors meeting where guys like Bill Gates and Michael Dell were supposed to be, but were probably at the same party. 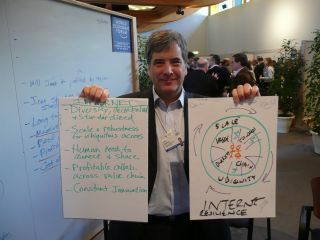 Being at Davos is part of being in elevated circles, but even the elevated circles have their upper levels. Compared to the previous year, the US political events were far less overwhelming given the current presidential elections, but the global politics portions was at least as interesting. 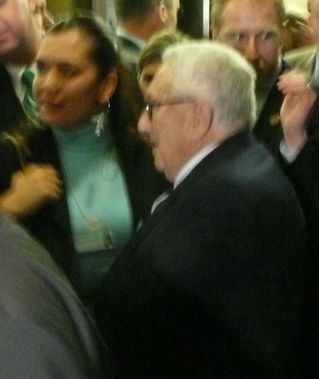 Hanging around after Condoleeza Rice's speech, I saw Henry Kissinger and Rupert Murdoch also hanging around me along with Hamid Karzai, president of Afghanistan. I doubt they recognized me though. 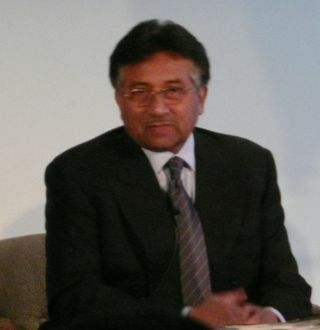 I was invited to a breakfast session with Purvez Musharraf, who was much more articulate and persuasive than I expected. I got some flack from some people of even attending, but I sat next to Jasmine Whitbread, CEO of Save the Children UK, who I figured if she was interested in different opinions of what was going, why could I be. Mark Zuckerberg, founder of Facebook, and the blogger Robert Scoble were there as well and you can read Scoble's account of what happened. I saw Gordon Brown in a couple of sessions, but at the time I was no where near as furious with him then as I am now. Technology definitely took a back seat to Social Enterprise this year. 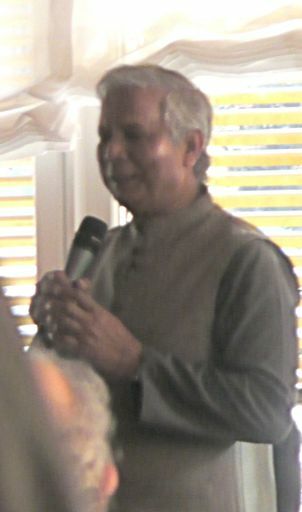 Although there were still luminaries, some of which I got introduced to thanks to Brian Behlendorf (man that guy networks well), it was guys like Nobel prize winner Muhammad Yunus that took center stage. Jimmy Wales, founder of Wikipedia, scoffed at being called legendary after being introduced after Muhammad Yunus, the man who created Microfinance. Unlike last year where Web 2.0 was a major theme, people who are trying to change the lives of people using the forces of capitalism and entrepreneurialism rightly were given the spotlight. Most of them you would never heard of, but they seem to really be making a difference in the developing world. 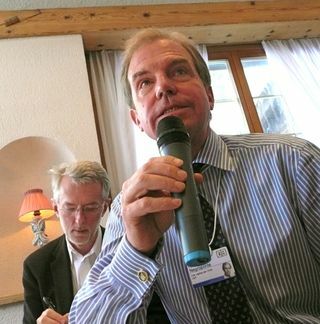 One you may have heard of is Nicholas Negroponte, who I sat next to at a lunch after he mistakenly tried to steal mine. We have since exchanged emails about how Alfresco and open source might be able to help the One Laptop Per Child initiative. If open source can help serve up content to all those OLPC systems, so much the better. Nicholas Negroponte with blogger Jeff Jarvis taking notes. Sorry this is a scary picture, but I was sitting right next to the guy when he was speaking. 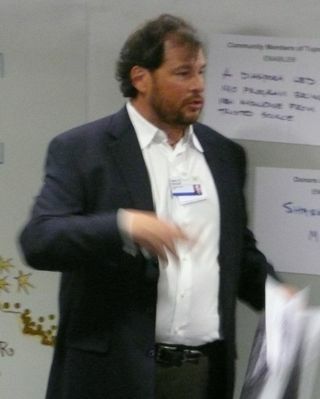 Most people at Davos are business people. Emma Thompson apparently described the crowd on BBC Radio 4 as a bunch of gray, middle aged businessmen in suits. (Well excuse me Emma!) There were in all the sessions and the vast majority of them are extremely nice and sociable. It was pretty cool hanging out with the Accel guys, Joe Schoendorf and Paul Jacobs, CEO of Qualcomm, drinking 50 year old Bordeaux wine. I shared a taxi with George Soros, who stole a place from my friend Magid Abraham, CEO of ComScore. Soros then had the misfortune of me plugging at him on the future of the dollar and pound. Eventually, he asked me what I did and I explained about Alfresco. George then said, "I *like* open source." So here's a scoop for you, George Soros is bearish on the US economy, the dollar, the pound and George Bush and bullish on China, India, and Open Source. I attended a panel on Strategy in a Networked World with Sam DiPiazza, CEO of PWC, Chris Conde of Sungard, Marc Benioff from Salesforce, Michael Porter, business professor at the Harvard Business School, and moderated by Tom Stewart, editor of the Harvard Business Review. I have met all of them and they are all nice, grey, middle aged and in suits, although Benioff stands out as being different. He is a bit younger, dresses more informally and is less likely to listen to what you are saying. I was in a collaboration session with him, business people from Cisco, HP, Sun and social entrepreneurs at the front line bringing in water, power and connectivity. Chris Gopalakrishan, COO of Infosys, actually knows a lot more about the 3rd world than most. Yet Mark was trying to tell him and others that the solution to poverty, disease and privation is a Web 2.0 center in villages running Salesforce.com. 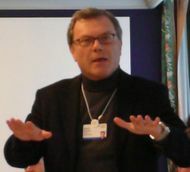 The dinners and parties continued to be the most impressive and fun part of Davos. The Accel party is definitely one of the highlights. 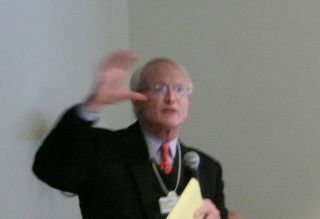 One moment at this year's party that I really liked was being able to introduce Michael Porter to Tim O'Reilly. Tim definitely knew who Michael Porter was, but Michael had no idea that Tim was the one who started a lot of all this Web 2.0 stuff. If Tim O'Reilly came away impressed, this event must be something else. Also, I am hanging around talking to people waiting to chat with Larry Page and find I am talking to the CEO of Mattel. Good thing I didn't ask him about toys from China. 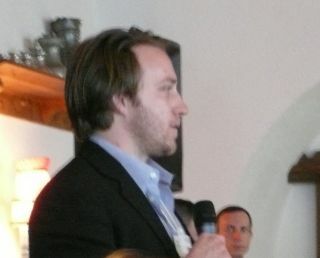 One of the Accel guys introduced me to the video blogger Loic LeMeur and I said, "I know you! You're famous." Immediately afterwards is the Google party with absolutely everyone in there. I attended a great "Eat Local" dinner hosted by Chez Panisse owner, Alice Waters, and the theater director Peter Sellars. The food was absolutely fabulous and it was really nice to meet Alice since I have enjoyed her food since my days in Berkeley, although Sergey Brin got a lot more attention. The Nerd's Dinner was also fascinating with so many famous tech people, I couldn't possibly list them here. That I have to blog separately. I tried to get a picture of Michael Porter when he wasn't moving his hands. I failed. He is very animated. In the end though, it is the people who make you think that have the most lasting impression. As always, it is great pleasure to hang around Geoffrey Moore, from whom I always learn something. 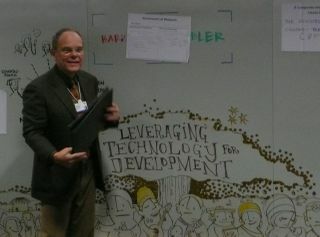 I was also very pleased to meet Don Tapscott, author of Wikinomics, and his wife. On the last night, I hung out with he and his wife and discovered he is a great jazz pianist. However, I learned about his next book about the Millennial generation joining the work force. The futurist Paul Saffo, the host of the Nerd's Dinner makes me feel like a real laggard. I am still in awe of Tim O'Reilly. Although I don't agree with some of what Tom Friedman writes, I still respect his perspective, which as influential when we started Alfresco, and I got to meet him this time and learn about his next book about Green Technology. Finally, Bill Gates got me thinking a lot. His speech on what he is doing next was well worth attending. 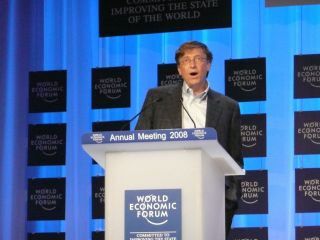 Bill's thesis is that if we can apply the principles of capitalism to solving the world's problems, we can eradicate hunger, poverty, disease, lack of power and climate change. Market and financial incentives alone are insufficient. We should all acting based upon self-interest and incentivized to work in that self-interest. Governments can help with tax incentives, but giving recognition to those companies and individuals are potentially more powerful. Companies should also be incentivized not to give money, but talent, which in turn provides recognition of the individual and organization making a difference. This recognition can be its own market-based reward since it will benefit the company in the competitive marketplace. This approach can be used to provide not just manpower, but solutions to accessibility of information, medicine and healthcare. Bill Gates talking about what he is planning next. Perhaps Google thought of this all along, but it seems like Bill has a point. As much as that pains me to say, clearly the programs and techniques that we have used in the past have not worked and we need to try something else. Maybe its time to try Bill's plan. I was challenged by one of the more liberal participants to not even think that. He said, "It's easy for him to say that. He's a billionaire. He made his money with blood money stealing from the poor children of the world." That's a bit extreme and I was just as culpable in this guy's eyes for even suggesting it, but I think it's worth exploring. If you have gotten this far, well done. Now that I have this one out of the way, I can concentrate on blogging properly hopefully. Sir Martin Sorrell, Chief of WPP, asking everyone to calm down.